A right angle finder is an L-shaped optical accessory with a mirror/prism angled at 45 degrees. It attaches to the viewfinder eyepiece of your SLR camera allowing you to look downwards into the viewfinder rather than the usual direct view. Angle finders are ideal for macro photography and similar situations where the camera is low to the ground making it awkward to get a comfortable view looking through the viewfinder directly. They are also ideal on a copy stand when the camera is at a high position and you would need to be a giant to look over the camera. Some are lifesize view with full screen image showing camera exposure data others also have a magnifying lens to deliver a 2x or even 2.5x view, making it a useful focusing aid. The periscope often rotates so you can shoot in horizontal or vertical format. They usually also have an eyepiece adjustment, making them perfect for spectacle wearers too. This Chinese product is a solidly made with a 1x and 2.5x viewing magnification. It has 360deg rotation, click stoped at 45deg intervals and has an adjustable dioptre eyepiece. It is bundled with 5 mounting pieces enabling it to be attached to most cameras made by Canon, Nikon, Fuji, Sony, Konica Minolta, Olympus and Pentax. high quality glass roof prism. This independent brand has a built-in diopter for individual eyesight adjustment. It has a magnification ratio of 1x or 2x and comes with five adapters for Nikon, Canon, Konica Minolta, Olympus, Fujifilm, Leica, and Pentax, it is also compatible for Hasselblad and Mamiya medium-format cameras with optional adapter. Also included is a protective case and a blower brush. Optical construction: 9 elements in 5 groups and angle prism. Compact item with 1x magnification and an eyepiece dioptre adjustment. Was Jessops branded and came in different camera fittings including Pentax, Olympus, Minolta, Nikon and Canon. Magnification ratio is up to 2x. moves 360 degrees for lots of flexibility. Provides an upright and un-reversed image for right-angle viewing. 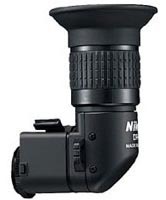 Has a round, screw-in mount that is compatible with F-series Nikon SLR cameras with a 19mm round non high eye-point viewing eyepiece thread including: F, F2, F3, F3AF, FA, FE, FE2, FM, FM2, FM3A and Nikkormat series. A DK-7 adaptor allows it to be attached to all Nikon SLR cameras with a 22mm round high eye-point viewing eyepiece thread but this may cause vingetting at corners. A successor to the DR-3 also with round, screw-in mount for all Nikon SLR cameras with a 22mm round high eye-point viewing eyepiece thread. Supplied with DK-12 adaptor required for use with cameras equipped with high eye point viewfinders. 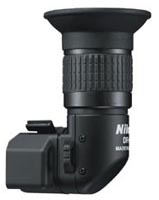 Use of DK-13 adapter permits use with All Nikon SLR cameras with a 19mm round non-high eye-point viewing eyepiece thread. Provides an upright and un-reversed image for right-angle viewing. Adjustments for individual eyesight are possiblen and allows adjustment of reproduction ratios of 1:1 or 1:2. 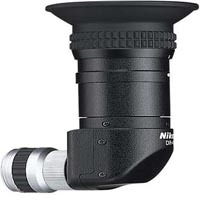 Fits all Nikon SLR cameras with a 22mm round high eye-point viewing eyepiece thread while removal of the eyepiece adapter ring allows use on all Nikon SLR cameras having a 19mm round non-high eye point viewing eyepiece thread. 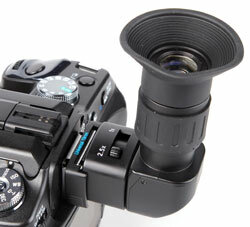 Has a slip on mount, making it compatible with all Nikon SLR cameras with a rectangular 22mm viewing eyepiece. This finder cannot be adapted for use on cameras with a round threaded viewing eyepiece. Canon A2 Right Angle Finder. It gives a correct image from top to bottom but it is reversed left to right. Works with the Canon A-1 camera body. Rotates 360 degrees with a built in dioptre adjustment and 16mm screw thread. For the early Minolta SR series 35mm cameras. Came with leather Minolta case. Made in Japan. high eye-point viewing eyepiece thread including: D1, D1H, D1X, D2H, D2X, F3HP, F4, F5, F6, F100, N90, N90s, N8008 and N8008s.